Artist Yayoi Kusama drawing. Courtesy of Tokyo Lee Productions, Inc.
Like Vincent van Gogh, Yayoi Kusama struggled to gain recognition as an artist for years as she battled with mental health problems. Unlike Van Gogh, though, who committed suicide at the age of 37, unaware that he would one day be recognised as one of the most influential painters in western art history, Kusama’s story has a happy ending. The incredible tale of how a girl from a conservative Japanese city spent decades battling social censure, sexism and racism to become the world’s highest-selling female artist is movingly told in Kusama: Infinity, a new feature-length documentary by American filmmaker Heather Lenz. Kusama was born in 1929 in the Japanese city of Matsumoto. Her childhood was blighted both by the horrors of the Second World War and by her parents’ unhappy marriage. Although Kusama fell in love with drawing at the age of 10, her parents disapproved and discouraged her from pursuing her passion. Kusama: Infinity delves into the artist’s past, from her unhappy childhood, to the 15 years she spent in New York from 1957 to 1973, trying to make a name for herself in America’s avant-garde art scene. Through interviews with prominent art-world figures and archival material including photographs, exhibition flyers and old film footage, Lenz details the impact Kusama’s prescient work had before her rise to fame. The film highlights how the young Kusama faced discrimination on two fronts, both as a woman and as a Japanese artist trying to carve out a career in post-war America. Her innovative ideas attracted little attention until they were picked up by high-profile white, male American artists, including Claes Oldenburg, Lucas Samaras and Andy Warhol, who appropriated elements of Kusama’s work and used them in their own exhibitions. 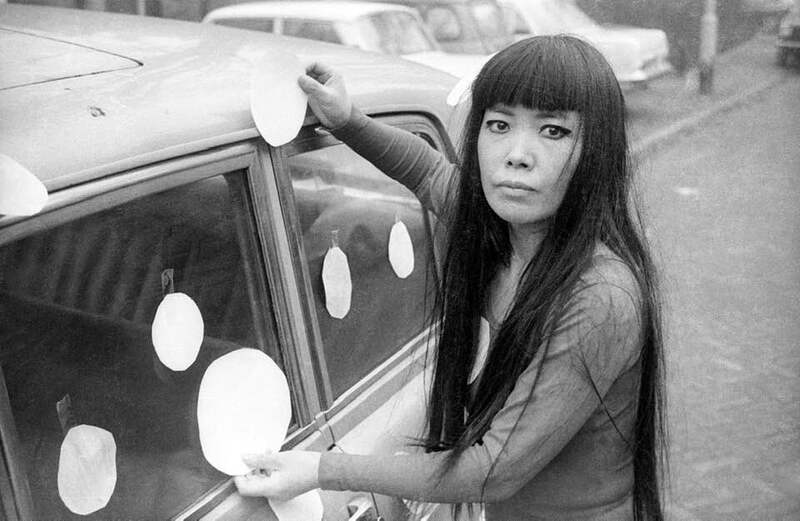 Kusama, meanwhile, became notorious for her controversial public performances and protests against the Vietnam war. In 1973, after a failed suicide attempt, she returned to Japan, and in 1977, took up residence in the psychiatric hospital in Tokyo that she inhabits to this day. It took Lenz 17 years to make Kusama: Infinity. When she started, Kusama was still a little-known artist and she struggled to find funders who would back her dream of documenting the artist’s life. By the time the film was released this year, Kusama had become world-famous, at 89 years old. During filming, Lenz was increasingly intrigued by Kusama’s tenacity and determination, finding that she faced similar problems with sexism in the film world. From an early age, she began to create paintings and sculptures characterised by repeating patterns, including polka dots and netting, which evoked this experience, conjuring up a sense of “self-obliteration.” The film explores the importance of repetitive pattern-making in Kusama’s work, as well as her 1960s invention of mirror rooms, in which the viewer is swallowed up by floating lights and eternally repeating reflections. In recent years, these immersive installations have helped propel her rise to fame. Kusama’s work was ahead of its time in the 1960s. Now, it has come into its own, a perfect attraction for the age of social media. 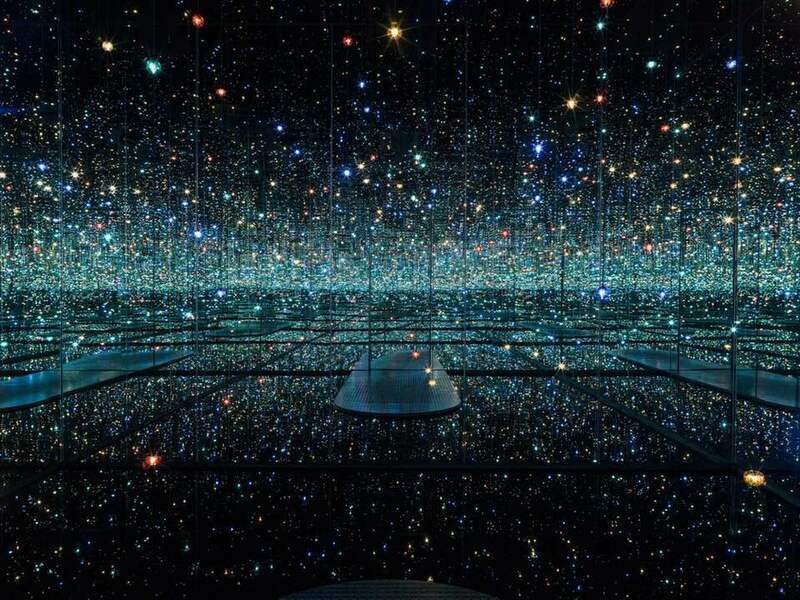 'Infinity Mirrored Room - The Souls of Millions of Light Years Away' (2013) by Yayoi Kusama. Courtesty of Dogwoof. Lenz brackets Kusama’s story between two pivotal events. The first is her decision to participate – uninvited – in the 1966 Venice Biennale. Kusama created an unauthorised installation of 1,500 mirrored glass balls in front of the Italian pavilion. 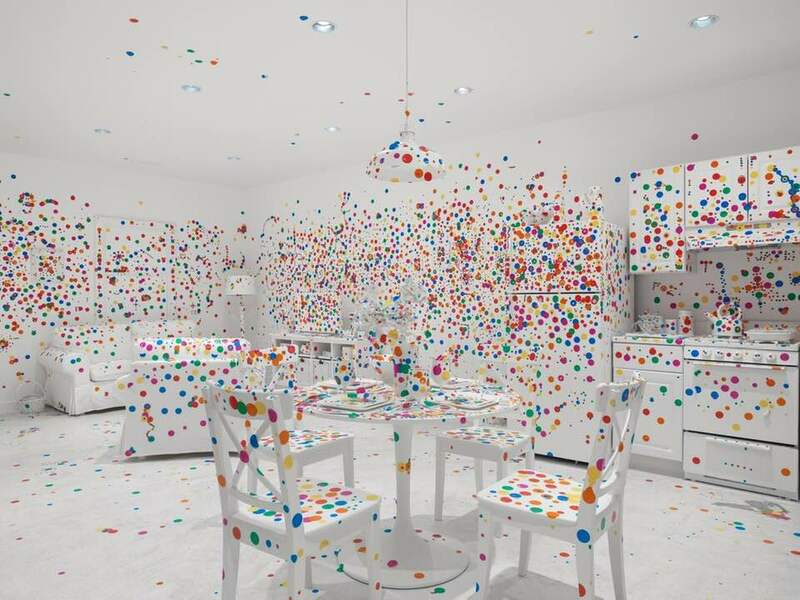 Entitled Narcissus Garden, the installation was both a way to leverage media attention and a subversive critique of the commodification of art – Kusama sold the balls to passers-by for $2 (Dh7.34) each, until she was asked to leave. Incredibly, almost 30 years later, after decades of obscurity, she was invited to the biennale in 1993, where she was the first woman ever to hold a solo show at the Japanese pavilion. Lenz says she had originally intended to end the film at this point, but due to the time it took to make, she instead chose to end with Kusama’s work being embraced by her home city. It is now on permanent display at the Matsumoto City Museum of Art. The face-to-face interviews with the artist, during which Lenz worked with translators, also helped to guide the direction of the film. “One thing that was surprising about Kusama was that every time I talked to her she always wanted to talk about world peace. It’s something very important to her and I think it goes back to her early childhood experience and the fact that it was so bleak,” she says. During the process of making the film, Lenz married a Japanese man whose grandfather was killed in the atomic bombing of Hiroshima. His story echoed Kusama’s childhood experiences of being taken out of school to sew parachutes at a military factory. “It was already important to me to include this childhood trauma that Kusama experienced because of the war,” says Lenz. “I felt during the making of the film for many years that the atomic bomb was ancient history, but unfortunately, with the way the world is now, I feel like ­people actually do have to worry about atomic war again. The world’s first dedicated Kusama museum is a house in a tall, narrow building in Shinjuku, not far from her studio and the psychiatric hospital where she resides. A new exhibition is staged every six months in galleries spanning five compact floors. 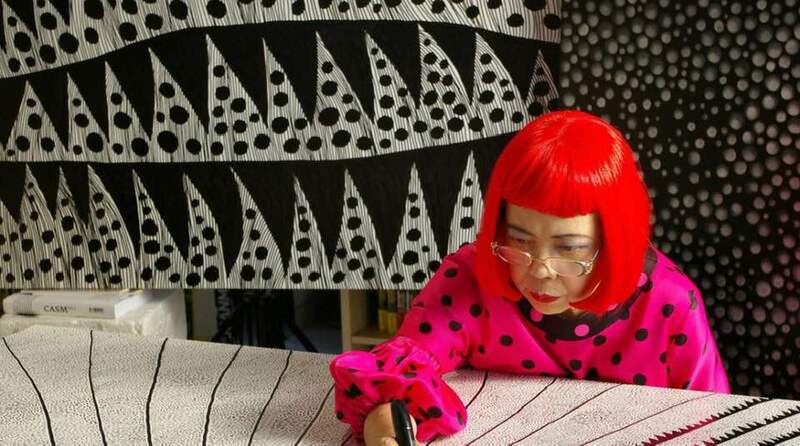 Expect to immerse yourself in her famous infinity mirror rooms and come face-to-face with many of her most iconic motifs, including pumpkins and polka dots galore. Tickets go on sale two months in advance and sell out fast, so forward planning is key. Naoshima is a unique attraction for art lovers. The small rural island combines traditional wooden Japanese houses with three monumental concrete art museums designed by Pritzker Prize-winning Japanese architect Tadao Ando. 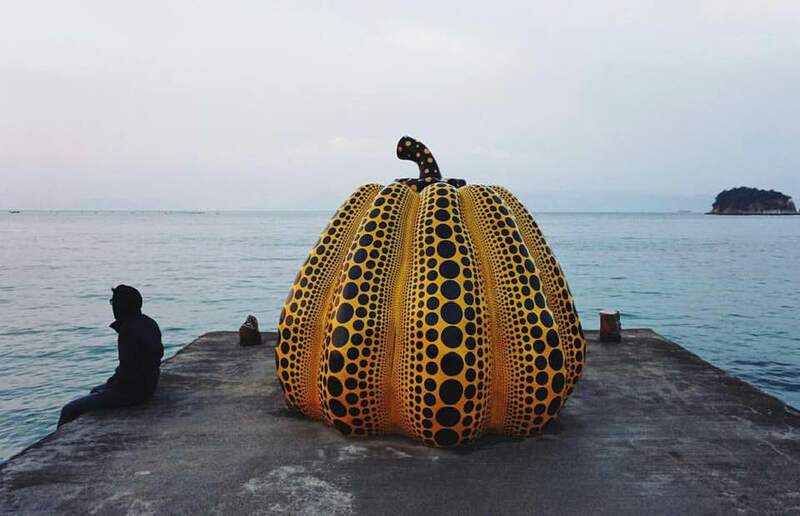 Its most iconic site, however, is a large yellow pumpkin covered with black polka dots, which stands at the end of a concrete pier jutting outside into the sea. Kusama’s sculpture is a magnificent sight that attracts a constant trickle of visitors from dawn to dusk. A second red-and-black pumpkin stands beside the ferry terminal on the opposite side of the island. This small museum located in the picturesque old district of Kyoto is almost entirely dedicated to works by Kusama, including an extensive collection of drawings of flowers – vivid, glitter-soaked and carnivorous-looking. The museum also contains some fascinating collages created in the years after Kusama first returned to Japan from America, as well as several infinity net paintings, a mirror room and one of her iconic soft sculptures, pioneered during her years in New York. Located at the foot of the Kirishima mountains, 700 metres above sea-level, this art museum features site-specific works created by 23 Japanese and international artists, spread across 20 hectares of rolling meadowland. It boasts two large-scale sculptures by Kusama. One is a giant stiletto shoe, covered with her signature polka dots. Another, entitled The Flowers of Shangri-La is a surreal curling mass of verdant leaves and vivid blossoms – naturally covered with polka dots. Perhaps the most interesting and moving place to see Kusama’s work is at this museum, located in her home city, where for so long she was rejected and denied. 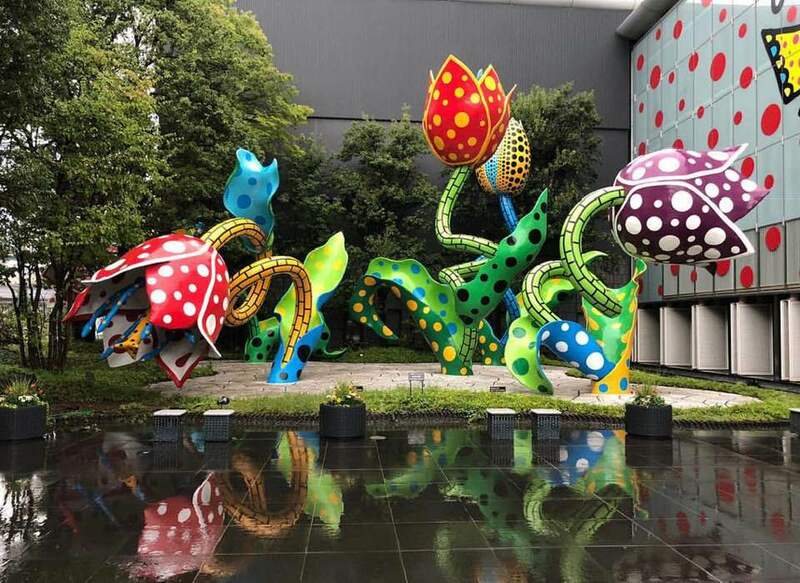 Kusama’s success story is brought home by the prominence of her enormous sculpture Flowers that Bloom at Midnight, located at the entrance of the museum. The museum showcases a permanent display of work by Kusama, including pieces starting from childhood and continuing to the present day.